This is really good news! We desperately need to stop all the insane amounts of vaccinations and very likely slow down and lower the increase in autism by eliminating insanity. Here’s the article with some really good news for a change! 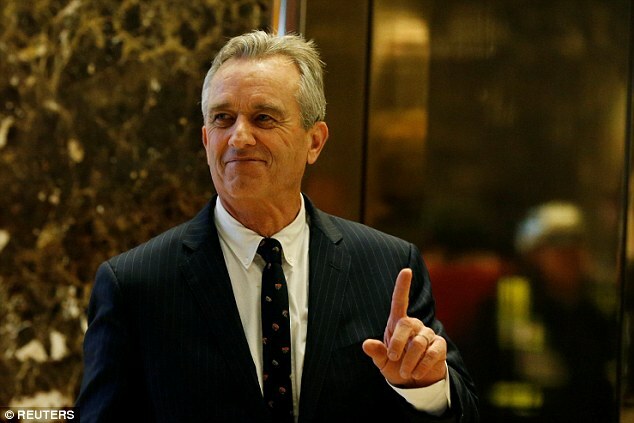 Robert F. Kennedy Jr. revealed his new role after a meeting at Trump Tower on Tuesday. He said Trump had asked him to head a commission on ‘vaccine safety and scientific integrity’ and that he had agreed to do so. Both Trump and Kennedy have have raised suspicions about vaccines despite their overwhelming support among scientists and physicians as a way to prevent the spread of deadly diseases that can infect infants and other children when the pool of protected people is diminished. ‘His opinion doesn’t matter but the science does matter and we ought to be reading the science and we ought to be debating the science,’ Kennedy added. Kennedy last year said vaccines were causing a ‘holocaust’ among children – he later apologized for using the loaded term. Kennedy’s appointment marries vaccine skeptics on the left and right, notwithstanding the widespread scientific consensus on the benefit of vaccine use on a population. Trump tweeted about vaccines in 2014: ‘Healthy young child goes to doctor, gets pumped with massive shot of many vaccines, doesn’t feel good and changes – AUTISM. Many such cases!’ he wrote. Thousands of individuals need to spend their lives behind bars, for what they have knowling and fraudulently done to millions of people. Shall we start off with knowingly allowing the injection of the sexually transmitted SV40 cancer virus into 150 million Americans in the late 50’s? Talk about the tip of the iceberg….